Notre B102 (Bâtiment B) condo vue sur l'océan a granit dans la cuisine ainsi que la salle de bain. Avec de nouveaux meubles, un nouveau téléviseur à écran plat, une nouvelle gamme moderne, un lit king size, un nouveau tapis de chambre à coucher, le système de brassage de café Keurig, une cuisine entièrement équipée, Pack-n-Play, etc., notre condo est très confortable pour nos invités. Il offre un accès facile aux verts, aux barbecues à gaz, aux bains à remous et aux piscines qui se trouvent à quelques pas de votre porte. N'hésitez pas à jouer au tennis sur les courts de tennis bien entretenus du Papakea Resort ou dans le salon près de la piscine. Profitez des brises tropicales et des couchers de soleil Maui tout en vous relaxant sur votre véranda privée. Vous comprendrez pourquoi Maui est classé l'île n ° 1 dans le monde! Cette propriété a de magnifiques jardins tropicaux et des étangs. Les installations comprennent 2 piscines, 2 jacuzzis, 3 courts de tennis éclairés, 2 jeux de palets, 2 putting greens, 12 barbecues à gaz, aires de pique-nique, parking gratuit, accès WiFi gratuit, tennis gratuit, appels locaux gratuits et conciergerie Luaus, les excursions d'observation des baleines en saison, la voile, les excursions de plongée en apnée, le golf, le vélo sur le volcan, et bien plus encore. Le magnifique établissement Papakea Resort Oceanfront Property se trouve à quelques pas de restaurants et de boutiques dans le quartier de Kaanapali à Maui. Il y a un grand supermarché en face de Papakea Resort. Vidéo panoramique: S'il vous plaît voir notre vidéo de notre spectaculaire condo oceanview, Papakea Resort, et des activités amusantes à Lahaina et Kaanapali. Mahalo! Papakea Resort a mis en place des frais d'utilisation des installations de 17 $ par jour (avec un maximum de 10 jours). Ces frais seront collectés par la réception. Les annulations peuvent être faites jusqu'à 60 jours avant la date d'arrivée pour un remboursement complet. Aucun remboursement si dans les 60 jours, quelle qu'en soit la cause. Beverly's condo is very comfortable and clean. She has everything needed to have a comfortable stay. I loved the ground level!! Beautiful and Relaxing Location - A little dated and not impressed by the concierge. This condo was good for us, but some might be disappointed. The location was great. Walking distance to the farmer's market and fish market. A short bus ride away from Whaler's Villiage and downtown Lahaina. The grounds were beautifully maintained. The condo itself was well maintained, but seemed a little dated. The bed was very comfortable, but the sofa smelled musty and was not very comfortable - for sitting or sleeping. I took one star off for the sofa. There is no real beach at this property. Only a sea wall. It was still pretty and relaxing. We could hear the ocean sounds from the room and see the sunset from the cabana or a bench at the ocean front. We were lucky enough to have cool weather, so we didn't need the AC. It being at the front and the bedroom being at the back, I'm not sure how well it would have worked if the temperatures were higher. My only other problem was with the concierge, Andrea. I spoke with her about a snorkeling trip, and after she told me the pros and cons of 3 options, I chose the mid-size option. It wasn't available for the day I wanted, but I booked it anyway. Although advertised as lunch and alcohol included, after I paid, she casually mentioned it was BYOB. A little confused, I left and after reviewing the sales pamphlet she had provided, saw that the trip was supposed to include alcohol. I returned to question it, and she said the company she signed me up with is in the midst of renewing their permit to serve alcohol. My husband wasn't even planning to snorkel - he was just going along to keep me company. He planned to relax with an adult beverage while I snorkeled. We didn't want the hassle of taking our own - we were here to get away from planning every moment of our lives. Andrea ended up charging me extra to book an alcohol included option, which, surprise! was available on the day I originally wanted. Unfortunately for the owners, I feel I have to take away another star for Andrea's shenanigans. On the bright side, the tour we ended up with on the Gemini with Captain J was excellent. I would recommend it. We appreciate all reviews; however, this one was reviewing Expedia Concierge service which we have no connection with. The sofa is only 2 1/2 years old and was purchased from an exclusive business on island. Our guests enjoy having the air conditioner available for their use, and we have had no complaints about its effectiveness. Had this guest actually used the air conditioner, perhaps he would not have been disappointed with it. All reviews are helpful. We had a great time in Maui, as usual. Our stay here Beverly's Papakea Resort suite was just what we needed in Maui. It was clean, comfortable with great access to all the Resort had to offer, as well as the surrounding area in Maui. The suite itself was well appointed with most accessories you'd need to enjoy yourselves. 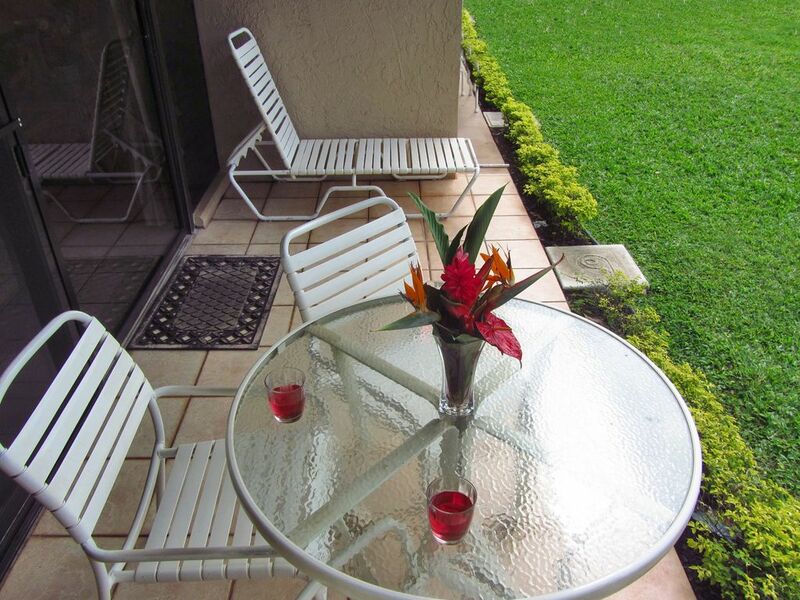 The gem lies outside the lanai with the well manicured grounds, koi ponds and easy pool access, plus its only a 30 second walk to the seawall and ocean views and West Maui sunsets. The pool was great. We'd be happy to stay here again. We appreciate such great comments from our guests. They were very descriptive of the resort's grounds and the condo. Thank you. We loved the ground level and access to the pool and hot tub. There is a grocery store nearby and the bus line is close by too. We also really liked the taco place across the street. The condo had a lot of necessities like towels and cookware. A rice cooker and a few more utensils (like spatula and another plastic flipper) would be helpful. When staying a long time the broom is nice but we didn’t see a dustpan so we just used the vacuum. There is a lot of glass (table tops) and mirrors. Window cleaner would be nice for the longer stays. The bed was comfortable and we liked the carpet in the bedroom. The couch is a little dated and another blanket would be helpful. We loved having a washer and dryer. You may want to check the lint tube. The dryer wasn’t drying very well. Thank you for sharing your condo with us for the holiday. We love Maui. We're happy that our guests enjoyed their stay at Papakea Resort and the many amenities the resort has to offer as well as the local restaurants. Our oceanview condo is completely stocked with kitchen utensils and extra sheets and blankets for the sofa bed. If a guest needs extra bedding or utensils, we encourage them to call us so that we can fulfill their additional needs. We're disappointed our guests felt that the sofa was dated as it is only two years old. We're pleased to provide a washer/dryer for our guest's convenience; unfortunately, the dryers are not as efficient in the tropical environment. The dust pan is actually in the hallway closet with the vacuum cleaner. Sometimes some items are overlooked as the guest is enjoying their stay in Maui. The property grounds are well kept and nicely maintained. La belle Papakea Resort est situé sur l'océan (à quelques pas de la plage, des restaurants et boutiques) dans la région Kaanapali de Maui. Voyage à seulement 10 minutes de la célèbre ville de Lahaina-le-champ le plus populaire sur Maui plein de magasins, dîner romantique en bord de mer, des salons de crème glacée, port de plaisance, et boîtes de nuit. Un paradis tropical! Based on 2 Guests; $10/night for extra guest Maximum of 4 Guests One-Time Cleaning Fee $110 17.91% Tax We accept e-Checks, VISA, Mastercard, American Express and Discover Free: Parking, Tennis, In-Room WiFi, Local Calls Papakea implements a $17/day Facilities Use Fee (10-day maximum charge every 30 days). The fee will be collected by the front desk. We have no involvement with this fee.